Wyoming National Parks feature unique landscapes, from simmering volcanic hot springs to towering monoliths and nearly perfectly preserved Eocene fossils, as well as a historic past that includes Native Americans, mountain men, Mormons, and dude ranchers. Each year, nearly seven and a half million people visit the seven national parks in Wyoming, according to the National Park Service. Devils Tower National Monument, located in northeastern Wyoming, is a huge natural monolithic pillar of igneous rock rising 5,111 ft above sea level (867 feet above the surrounding plain and 1,267 ft above the Belle Fourche River). The plateau at the top measures 300x180 ft. About one percent of the visitors scale the tower to that plateau each year. Exactly how the formation came to stand above the surrounding area is in some dispute. The surrounding plain is sedimentary rock, layers laid down by shallow seas between 225–60 million years ago. The tower is made up of hexagonal columns of phonolite porphyry, thrust upward from the subsurface magma about 50–60 million years ago. One theory is that the tower is the eroded remains of the cone of an extinct volcano. It's also possible that the magma never reached the surface, but was exposed by later erosional forces. The monument's first name in English was Bears Lodge, and most of the Native Americans who reside in the area call it "the place where the bears live" in their various languages. The Arapaho, Cheyenne, Crow, and Lakota tribes all have origin myths about how the tower was created as a home for bears. Apparently, "Devils Tower" was a mistranslation of "Bear's Lodge" by mapmaker Henry Newton (1845–1877) when he was creating what would become part of the official map in 1875. A proposal from the Lakota Nation to change the name back to Bears Lodge—the name Devils Tower has an evil connotation that is offensive to them—was made in 2014 but has been hung up in Congress until 2021. The Fort Laramie National Historic Site, on the North Platte river in southeast Wyoming, contains the reconstructed remains of the largest and best-known military post on the northern plains. The original structure, known as Fort William, was established in 1834 as a fur trading post, and a monopoly on buffalo fur was kept by owners Robert Campbell and William Sublette until 1841. The primary reason for building the fort was a trade deal with the Lakota Sioux nation who brought tanned buffalo robes to trade for manufactured goods. By 1841 the buffalo robe business had declined. Sublette and Campbell replaced wooden-built Fort William with an adobe brick structure and renamed it Ft. John, and it became a stop for tens of thousands of Euro-american migrants bound for Oregon, California, and Salt Lake. In 1849, the U.S. Army bought the trading post and renamed it Fort Laramie. Fort Laramie played a significant role in the "Indian Wars" of the latter half of the 19th century. In particular, it was the site of treacherous treaty negotiations between the US government and the Native Americas, including the Horse Creek Treaty of 1851 and the contested Sioux Treaty of 1868. It was also a transportation and communication hub through the central Rocky Mountains, as a stop on the Pony Express and various stage lines. The post was abandoned, sold at public auction in 1890, and left to rot until 1938, when Fort Laramie became part of the National Park System and the structures were rehabbed or rebuilt. Fossil Butte National Monument in southwestern Wyoming holds an unparalleled fossil record of the Eocene Green River formation of about 50 million years ago. Back then, the region was a large sub-tropical lake measuring 40-50 miles north-south and 20 miles east-west. Ideal conditions—quiet water, fine-grained lake sediments, and water conditions that excluded scavengers—helped preserve the entire, articulated skeletons of a large variety of animals and plants. Fossil Butte includes fossils of 27 different identified fish species (stingrays, paddlefish, gars, bowfins, rays, herrings, sandfish, perches), 10 mammals (bats, horses, tapirs, rhinoceroses), 15 reptiles (turtles, lizards, crocodilians, snakes), and 30 birds (parrots, roller birds, chickens, waders), as well as amphibians (salamander and frog) and arthropods (shrimp, crayfish, spiders, dragonflies, crickets), not to mention extensive amounts of plant life (ferns, lotus, walnut, palm, soapberry). The Grand Teton National Park, located south of Yellowstone in northwestern Wyoming, is set in a large glacial valley bisected by the Snake River. 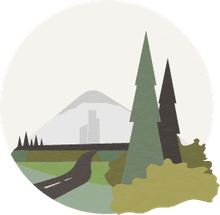 Ringed by the Teton Range of mountains, and to the east of Jackson's Hole, the valley harbors a variety of ecozones: floodplains, glaciers, lakes and ponds, forests, and wetlands. The park's history includes that of the fur trappers known as "Mountain Men," such as David Edward (Davey) Jackson and William Sublette, who based their beaver-trapping operations here. The beavers were nearly depleted by over-trapping. By the late 1830s, easterners switched to silk hats and the mountain man days ended. By the 1890s, a brisk dude-ranching enterprise began when cattle ranchers charged guests for lodging. By 1910, new facilities were established for the specific purpose of giving easterners a taste of the "wild west." The White Grass Dude Ranch in the park is the third oldest extant example of a dude ranch in the west, built in 1913. The Mormon Pioneer National Historic Trail crosses the western half of the United States and extends through Illinois, Iowa, Nebraska, Wyoming, and Utah. It identifies and preserves the 1,300-mile pathway used by Mormons and others who were migrating westward from Nauvoo, Illinois, to what would become Salt Lake City, Utah, mostly between 1846 and 1868. In Wyoming, a significant stopping place was Fort Bridger, in the extreme southwestern part of the state near the border of Utah, and about 100 miles east of Salt Lake City. Fort Bridger was established in 1843 as a fur trading post by the famous mountain men Jim Bridger and Louis Vasquez. The original configuration was made up of a structure about 40 feet long with pair of double-log rooms and a horse pen. Bridger and Vasquez teamed up to provide a supply depot for the rapidly increasing number of settlers passing through on their way west. The Mormons first passed through Fort Bridger on July 7, 1847, in a party guided by their leader Brigham Young. Although at first relations between the Mormons and mountain men were reasonable (although the Mormons thought their prices were too high), for long-disputed reasons, the relationship became strained. The "Utah War" was fought in part over Fort Bridger, and the upshot was that the US government obtained the fort. In the 1860s, Fort Bridger was a stop on the Pony Express and Overland Stage, and when the transcontinental telegraph was completed on October 24, 1861, Fort Bridger became one station. During the Civil War, the fort was used to house volunteer units. After the railroads were expanded in the west, Fort Bridger became obsolete. Yellowstone National Park spans three states—Wyoming, Idaho, and Montana—, but the largest part by far is in the northwestern corner of Wyoming. The park includes 34,375 square miles and is one of the largest nearly intact temperate-zone ecosystems on our planet. It features a living volcanic landscape at 7,500 feet above sea level, and it is covered with snow for much of the year. 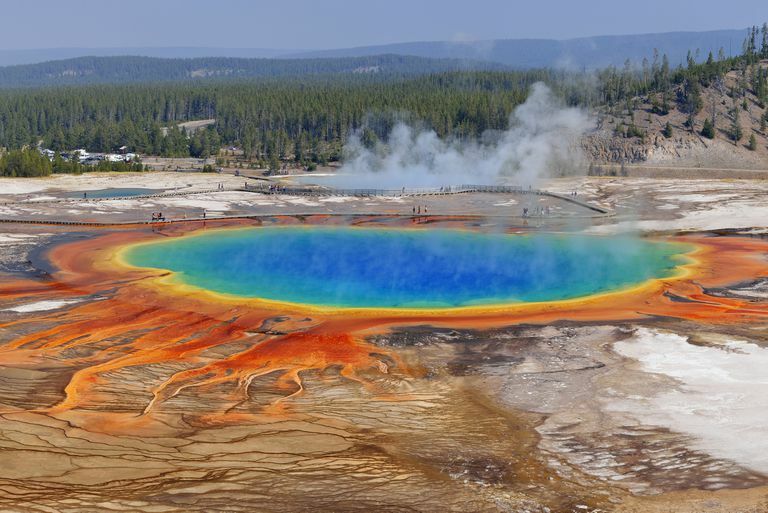 The park's volcanic nature is represented by more than 10,000 hydro-thermal features, primarily hot springs—pools of geothermically heated water—of many shapes and sizes. The park has geysers (hot springs that regularly or intermittently send up a tall column of water into the air), mud pots (acidic hot springs that melt the nearby rock), and fumaroles (steam vents that don't include water at all). Travertine terraces are created by hot springs when the superheated water rises through limestone, dissolves calcium carbonate, and creates beautifully intricate calcite terraces. In addition to the eerie volcanic environment, Yellowstone supports forests dominated by lodgepole pine and interspersed with alpine meadows. Sagebrush steppe and grasslands on the park’s lower-elevation ranges provide essential winter forage for elk, bison, and bighorn sheep.